Latest update: Summary - Flights from Sharm el Sheikh to UK will resume on 6 November. 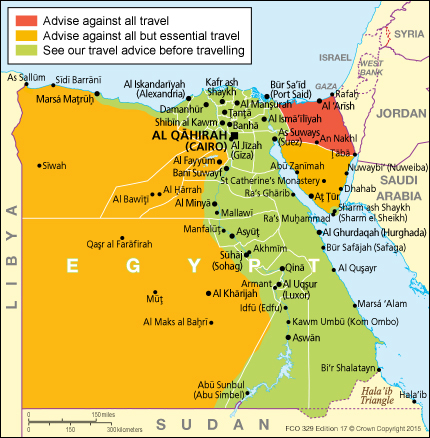 The area to which the FCO advise against all but essential travel does not include the tourist areas along the Nile river (eg Luxor, Qina, Aswan, Abu Simbel and the Valley of the Kings) or the Red Sea Resorts of Sharm El Sheikh and Hurghada. On 31 October 2015, a flight from Sharm el Sheikh to St Petersburg crashed in North Sinai. Egyptian and Russian authorities are conducting an investigation in line with international regulations. There is a significant possibility that the crash was caused by an explosive device. As a precautionary measure, we are now advising against all but essential travel by air to or from Sharm el Sheikh. UK carriers will not take passengers directly to Sharm el Sheikh airport. We have worked with the Egyptian authorities and air carriers to put special security measures in place to permit travellers in Sharm el Sheikh to return by air, whether as scheduled at the end of their stay or before that if they wish. Outbound flights from the UK to Sharm el Sheikh remain suspended. We have decided, in consultation with the airlines, that flights from Sharm el Sheikh to the UK will resume on 6 November 2015. British nationals affected by this should contact their tour operators or carriers on their travel plans. The additional security measures will include permitting passengers to carry hand baggage only and transporting hold luggage separately. We are working with the airlines to ensure there are suitable arrangements in place to reunite passengers with their belongings as soon as possible. We are not raising the threat level in the resort. The above advice applies only to air travel to and from Sharm el Sheikh. We have deployed consular staff to Sharm el Sheikh, who will be on hand at the airport and the resort, to assist British nationals. Parliamentary elections are scheduled to take place from 18 October to 23 November. There may be rallies around the country in the run up to the elections. You should avoid all rallies and demonstrations. On election days tight controls will be in place around polling stations with access restricted to voters and officially accredited observers. In previous elections British nationals have been arrested close to polling stations. Avoid polling stations and don’t take photographs nearby. Terrorists continue to plan and conduct attacks in Egypt. Since 2013, attacks have mainly targeted the security forces, their facilities and other government buildings. You should take great care near these places. There have been threats to western nationals, institutions, and businesses posted on websites and social media. Foreigners could be targeted in tourist resorts or other places. Attacks could be indiscriminate and may occur without prior warning. There is a threat of kidnapping, particularly in remote desert areas. On 22 July 2015, a foreign national was kidnapped in the western desert. He was murdered in August 2015. A terrorist group has claimed responsibility for his murder. The FCO is constantly reviewing the threat to British nationals from international terrorism and will reflect any credible threats in this travel advice. Enhanced security measures are in place to protect the Sharm el Sheikh and Hurghada resort areas. Security forces are situated at the international airports, at check points around the perimeter of the towns and throughout the Governorates. Routine security checks are being performed on entry into the airport and the police are carrying out vehicle checks in the towns. There is a significant possibility that the crash was caused by an explosive device. As a precautionary measure, we are now advising against all but essential travel by air to or from Sharm el Sheikh. Protests, marches and demonstrations can occur across Egypt, often on Fridays, but also at other times and with little prior notice. British and foreign nationals have been arrested during demonstrations. The atmosphere at demonstrations can change quickly and without warning. Police may use water cannon, tear gas, birdshot or live ammunition for crowd control.